JRPGs need some serious help. When I was a child, I played a game called Final Fantasy VI. It was one of my first turn based RPGs, and it remained my all time favourite game through multiple generations of consoles. Even though no RPG ever topped it, Squaresoft kept putting out memorable and popular new RPGs up until FFX on the PS2, to list them all would take an article in itself; not to mention other major entries like Wild Arms, Grandia and Suikoden. Then, something happened. By the time the PS3 came out, technology had come to a point where the action RPG was ready to make a huge expansion beyond the few Star Ocean and Tales games that had even managed to make it out of Japan. The West was a big part in this, pushing out Skyrim and the Witcher, and even bringing the RPG out of fantasy and into shooters with Mass Effect. The market for the slow paced game that I’d loved since I was a child had seemingly disappeared. The PS2 library on my shelf is almost nothing but turn based RPGs, while the PS3 library is almost devoid of them. It might be considered a bit sad, but for many of us we embraced games that largely felt the same except for requiring us to be constantly in motion, and with beauties like Dark Souls and Dragon’s Dogma we likely did not even notice. Now, you may be wondering- why the preamble, why not just talk about Persona 5 (which yes, is the game I am going to review, fear not we didn’t mislink it). The answer is; this is not just another JRPG, it’s a part of the shift in the dynamic of the true turn based RPG of the past. Turn based RPGs didn’t vanish; we can all name a handful of them we’ve played or heard of in the last few years, games like Disgaea and Pokemon still have large followings from big companies, but these are increasingly pushed to the handheld and tend to change very little each year. The indie developer scene has happily picked up the slack, but while there are definite gems like Child of Light and I Am Setsuna, and games with cult followings like Neptunia it is clear this is a genre that is looking back and attempting to capture nostalgia more than it is to contend. Atlus itself is one of the biggest producers of nostalgia inducing JRPGs, but while I love this company I have to admit most feel like cookie cutter cash-ins. We’re now on the PS4, and even the giant has given up. Square Enix’s Final Fantasy XIV doesn’t even try to resemble its roots by jumping on the action RPG bandwagon. With a PS4 shelf utterly bare, Persona 5 comes out. Depending on its reception, this could be perhaps the last big turn based RPG before its fully relegated to the 3DS. Yes, Persona 5 decided to go with the turn based JRPG formula it has always had, and with the popularity of Persona 4 almost a decade prior, there really was no reason to update; nostalgia alone would have made sales phenomenal and even with a simplistic approach to game development the unique way Persona handles philosophy and story would have captured and enthralled fans of the previous games. Certainly, the biggest worry any of us could have is that this game not only won’t live up to the expectations of its predecessor but will utterly destroy the series in an embarrassing crash and burn. Duke Nukem Forever comes to mind, but I am sure each of us has a game or two we’ve waited, excited, for a decade or longer to get our hands on only to be crushed. Without any further philosophical delving into the state of games though, it is time to examine the much anticipated Persona 5. 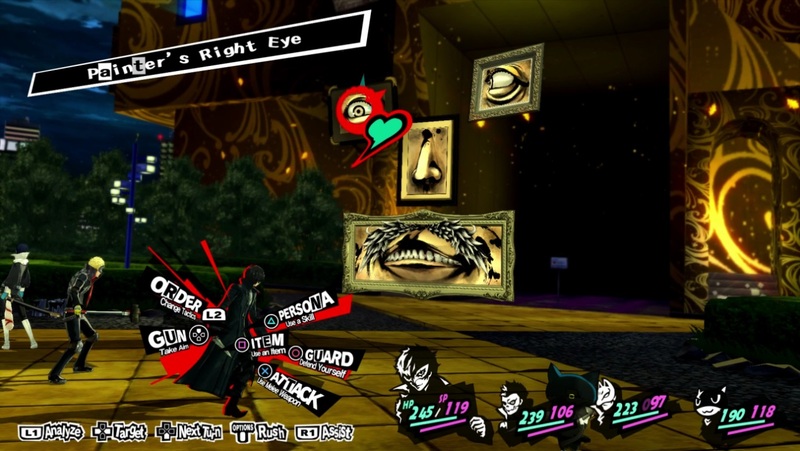 Persona 5 is incredibly topical; taking place in today’s Tokyo it is able to tackle issues as diverse as identity and politics to apathy in the population, groupthink and even fake news. If it has been a major topic in the past few years, chances are good this game touches on it and does so in a way that is not conclusive and hopefully non-triggering; focusing on the struggles of a group of high school students faced with the unfair and harsh realities of an adult world. Themes get fairly dark at times, but the game is just as evenly packed with hilarious moments, and a fantastic cast of characters each with their own worries, flaws and endearing traits. 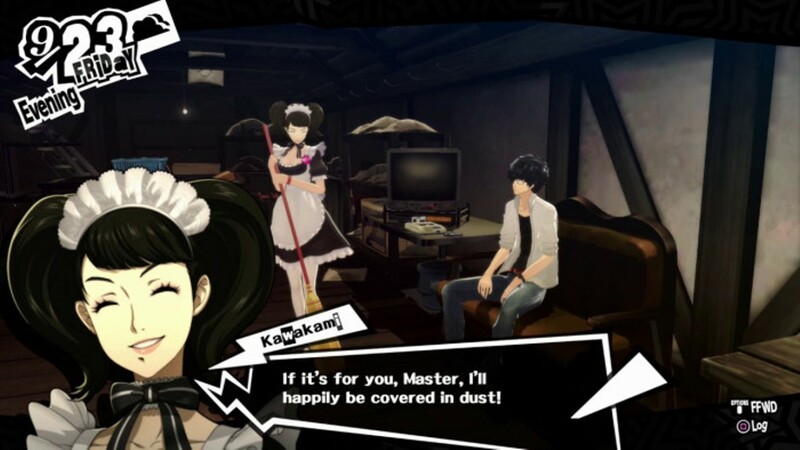 Unlike most JRPGs which are characterized by a linear plot and no choices, Persona 5 is almost overwhelming with your ability to choose from what you do on a day to day basis in game, everything from studying for exams to getting to know your friends better to even enjoying a plethora of mini games like fishing and batting practice. While the mini games sometimes fall a bit flat, the variety makes it very easy to ignore anything you have little interest in while you pursue other paths. There are some limitations, such as goals that are necessary each month (you also do not have the ability to kill everyone you meet, for those used to Western style ‘choice’). As well, the overarching plot of the game does have a path to follow so you’re never left completely aimless. The world feels full, from the moment you step off a train in Tokyo you are surrounded by the faceless masses going about their business yet feel lost and alone those first few days finding your bearings. Previous installments excelled in their sense of style, buffed up largely by graphical aesthetic and of course the highly unique soundtrack. I honestly found it hard to imagine some of the boss tracks from Persona 4 and 3 would ever meet their match, or emotional tunes such as P4G’s Snowflakes. Persona 5 matches and more, with music that captures the mood for the exciting heists, clutches your chest in the despair of awful situations, and for the first time in ages I was overjoyed to face a long boss fight because I knew my ears were in for a treat. This game is meant to make you despise its villains and get attached to the protagonists, and while the writing could easily do this on its own, I haven’t seen a game this effective at combining script, sound and aesthetic to pull you in since Metal Gear Solid 4. Not only do you hate the villains; their motivations and actions are real enough that you cannot help but feel there are people out there who are just as horrible in the real world. This should not be too surprising, as the series constantly deals with the subconscious of human minds, but sadly while the best part of the game is the story it is also the part I do not want to talk about in a review as there is so much to spoil. Now, if you have played Persona 4, you know how amazing it is. You also know though how it had some glaring flaws. Up until now, I could have assumed a great many of these things going into the game because that would have been a justified sequel- take the same model, make some improvements and push out a respectable product. Persona games though do have some parts which can be frustrating, bland or even downright bad. One of the things Persona 4 Golden did that greatly improved the game was its online features. Note, these are single player turn based RPGs, and that hasn’t changed. What it did add was the ability to find out what other players have done during the day. In a game with dozens of options each day, that rotate with schedules (ie- the movie theater might be closed during the day, or a friend might be busy on weekends) it could be extremely hard just remembering what you can do, and searching the entire map each day in a game that lasts most of a year might sound painful because frankly, it was. 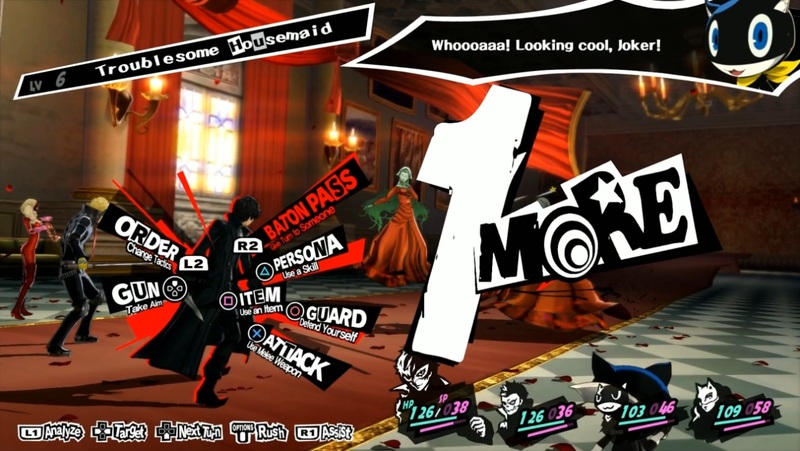 Persona 5 has taken this starting point and advanced it beyond just know what others have done each day (great for knowing what you even can do). There are markers on the map for available friends to socialize with, and an easy to use fast travel system and your friends will often call you asking to hang out when they’re available or to update you on quests or tasks. Furthermore, NPCs worth talking to stand out in the crowd so looking for new flavour text like in old RPGs has been overcome in a way that doesn’t break emersion. You also unfortunately have a cat that enforces a strict curfew… uh, that… makes more sense when you play the game. 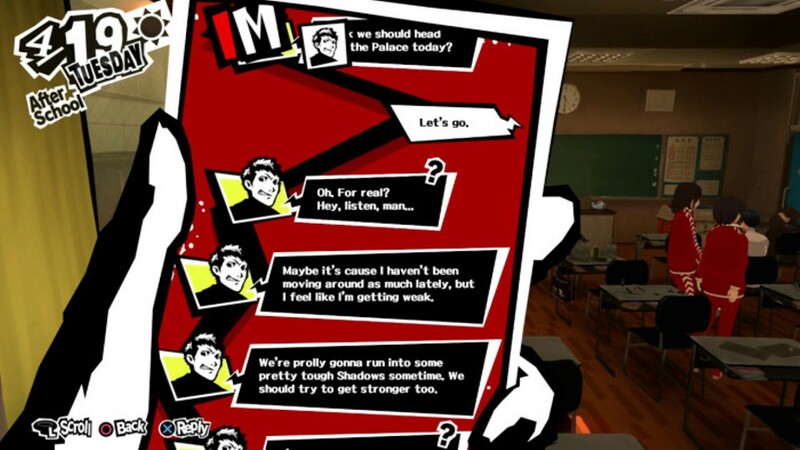 Pacing was also a major issue in earlier games, but due to the way the dungeon runs are separated (unfortunately, I can’t go into this without spoiling things) in Persona 5 you will likely find yourself alternating regularly between social activities and fighting shadows. There are great incentives for both exploring and spending time with friends that, along with the regular break up with set story events, make pacing one of the game’s strengths rather than a weakness. Of course, the game does have fighting, and it looks and flows better than ever before. Enemies have weaknesses that you learn and retain through attacking, there are multiple ways to handle fights which rely on the concept of you being a group of thieves and you actually learn techniques from your socializing; making the two aspects of the game more heavily reliant on each other than ever before and in a way changing how you can approach fights based on choices you make. Abilities unlock to let you befriend or mug enemies, or even deal devastating blows, while others might increase your XP or yen from fights. Yet, the combat system, while needing work, was already good in Persona 4, so again the question comes up- has Atlus done anything here to make this game a true contender in the current market? Up until now, I have detailed a game that is clearly the best in the turn based RPG market, I’d already be considering it my GOTY and be placing it with Dark Souls 3 and Witcher 3 as one of the best RPGs of any sort this generation. Yet, there’s one final thing I have not touched on, something that Persona lovers cringe just thinking of because it was subpar in Persona 4 and downright cringeworthy in Persona 3. Yes, it’s time to talk about the dungeons. In P3, these were randomized blocks similar to Diablo, and enemies would simply stroll around waiting for you to run into them. They were also bland, featureless and ugly to look at, which when you consider dungeon exploration is half the game that is not really something you want to hear. Persona 4 did improve on this, with artistic themes and symbolic music each different dungeon was a treat to be in from that perspective- but the layout was still uninspired and it really just functioned as a place for enemies to be in while you went towards the boss. So now I’m going to explain why after everything else I’ve had to gush about this game, the dungeons are the best part of Persona 5. These are hand crafted and decorated to specifically enhance the symbolic nature of each area as you slowly find out more and more about the dungeon, often from the dungeon itself. The slow filter of information as you see a bit more of each full picture makes it all the more enticing to go further in, and I would often find myself wanting to go just a little bit further before going to bed even when I knew I shouldn’t stay up any longer. Dungeons feel considerably more alive, with a personality that permeates from it and its inhabitants and is always tied in very closely to the story, which is truly what is greatest; these dungeons fit perfectly into the puzzle, whereas in previous Persona games it could often feel like you had two separate games you were going back and forth from. On top of each dungeon having an aesthetic theme that fits it, various activities you perform differ depending on where you are. Stealth is a big part of the game, along with other infiltration activities. Everything you can expect from being a thief comes into play, between sneaking through vents and avoiding traps to getting the drop on your foes. The approach to the game is perhaps not as sophisticated as a Deus Ex or Assassin’s Creed but when it comes to RPGs this is the best integration of stealth gameplay I have ever seen. Rather than being a detriment, exploring dungeons is enjoyable and offers something new and unexpected. Most importantly, after decades of fairly predictable and static turn based RPG dungeon crawls it proves that there is in fact a place for this genre to improve. That I think is the biggest take away; in a stale genre that many have abandoned and where little innovation inside has been seen in years this shows that JRPGs have not in fact yet hit their peak with nowhere to go but down. There is still a place here for the big developers to give it their A game. Persona 5 is brilliant in every way, this is more than a game I merely enjoyed this is a game I adore. I’ve loved this style of game since I started gaming, but if asked to describe what I love about any individual turn based RPG my answers will often be drawn to the same things- a nostalgic combat system, enjoyable characters and an enthralling story. There is so much more to this game than that, and if you enjoy RPGs you absolutely have to play this game. I have only a single disappointment when it comes to Persona 5 after spending a hundred hours to beat it, knowing I’m going to do a second playthrough soon (actually, I’m already ten hours in) and spending several more hours writing this review. It’s been 20+ years since I first played Final Fantasy VI, will I be waiting another 20 years before I play a game that topples Persona 5 as the best game of all time?